In 2014 more than 47,000 Americans died from a drug overdose. The CDC reports that drug-related death rates in Appalachia and the Southwest were especially high, but in almost every county in the country, the numbers are rising. Treatment programs are expensive, sometimes not easily accessible and often not successful. Political leaders of both parties have stressed the toll that drug addiction is taking on communities and, at times, in their own families. President Obama has pledged to step up support and so have many state and local officials. Please join us for an update on the rising drug addiction crisis and the new efforts to address it. Dr. Nora Volkow Director, National Institute on Drug Abuse of NIH. MS. SUSAN PAGEThanks for joining us. I'm Susan Page of USA Today sitting in for Diane Rehm. She's recovering from a voice treatment. The number of deaths from overdoses of heroin and prescription painkillers is rising sharply in counties all across the United States. People in every part of the country and from all socioeconomic groups are affected. MS. SUSAN PAGEJoining me in the studio to talk about the drug addiction challenges many communities face and the help they say they need, Dr. Nora Volkow of the National Institutes of Health and Amy Cassagnol, a teacher and the parent of a young adult son who recently died of a heroin overdose. Thanks so much for being with us. PAGEAnd joining us from a studio in New York City is Dr. Andrew Kolodny of Physicians For Responsible Opioid Prescribing. Welcome, sir. PAGEBut first, we're going to talk for just a few minutes with Governor Maggie Hassan, the governor of New Hampshire, who joins us on the phone from Concord. Governor, thanks for being with us. GOV. MAGGIE HASSANThanks for having me this morning, Susan. PAGESo Governor, what have you seen in New Hampshire when it comes to this addiction crisis? HASSANWell, the opioid crisis is our most pressing public health and safety challenge in New Hampshire. We have seen more than 400 overdose deaths in 2015 and it's caused by a convergence of many, many factors, but we are really all focused in New Hampshire now on coming together as a state and taking this challenge on with a truly comprehensive approach that both supports law enforcement and strengths prevention, treatment and recovery. PAGENow, you had called a special legislative session in November. I gather you're going to sign two bills this afternoon that came out of that. What do those bills do? HASSANWell, we called a special session in November because it was clear that there were certain steps we needed to take as quickly as possible to help us stem this tide and eventually lead to our being able to reverse it. And so the two bills that I'll sign this afternoon are really -- do a few things. One, cracks down on Fentanyl. Fentanyl is an opioid that actually is more lethal than heroin and a lot of dealers are cutting heroin with it. HASSANAnd the penalties for distributing it aren't as significant or severe as the penalties for distributing heroin. So we wanted to make sure that our law enforcement officers would have that tool at their disposal and that we would be sending a very strong message to dealers and suppliers that we weren't going to tolerate Fentanyl in our state. We also wanted to make sure we could streamline access to treatment. HASSANSo it was very important that all insurance companies use the same criteria as they're approving treatment for people suffering from addiction. We also took steps in that bill to strengthen our prescription drug monitoring program and we added two doctor members to our board of medicine, making sure that there is a pain specialist on the board. One of the things we confronted over the summer and fall was the fact that our board of medicine guidelines for prescribing opioids were just terribly outdated. PAGENow, I know that New Hampshire has had a great challenge in terms of providing treatment facilities for people who need them. I was reading last night that New Hampshire has about 100,000 people who need treatment, but the public finance system in the state can serve just 4 percent of them. Is that right? And what do you do about that gap? HASSANWell, we certainly know we have a treatment gap and one of the things we did in 2014 was pass the New Hampshire Health Protection Program, a bipartisan form of Medicaid expansion. And Medicaid expansion provides coverage for both substance abuse and behavioral health treatment, which are very, very important as we confront this opioid crisis because sometimes that behavioral health and substance abuse co-occur. HASSANBut even when they don't, we needed the substance abuse treatment as well. What we're dealing with right now is that we authorized the New Hampshire Health Protection Program only through January of '17 and we need to reauthorize it because many of the treatment providers who are ready to expand capacity need to know that we will have that program in place to provide coverage before they want to make the capital investment to expand treatment. HASSANSo the single most important thing we can do next is reauthorize our bipartisan Medicaid expansion program to make sure we can expand treatment capacity in our state. PAGEGovernor, a last question. You are, of course, at the center of the political universe every four years, including at this period right now with the presidential primary coming up in New Hampshire. And one of the things we've seen in this political season is presidential candidates talking in a very open way about the addiction challenges their own families have faced. Jeb Bush talking about his daughter. Chris Christie talking about his mother. Carly Fiorina talking about her step-daughter. PAGEDoes that make a difference, do you think? HASSANOne of the things we have all come to realize together is that this crisis affects people from all walks of life. I can't go anywhere in New Hampshire without talking with somebody whose family or friends have been affected or lost a loved one due to this crisis. The presidential candidates in New Hampshire have an opportunity like nowhere else to really talk to real people in our state about what's on their mind and citizens of New Hampshire are used to sharing and helping engage the candidates in the things they need to know about. HASSANI'm very impressed that Hillary Clinton, who I'm supporting for president, really took what she's heard from our people and businesses and developed a comprehensive plan to address this challenge. And that's what we need at this point. We have so many brave citizens, those in recovery, those who have been pulled out of an overdose because we've made Narcan much more available in this state, which helps rescue people from an overdose. HASSANThey have stood up and self-identified and shared their stories so that other people can get help. What they deserve from their elected leaders is action and a plan that really works. And Hillary Clinton has really focused on that and I'm very, very proud of the work she's doing and I'm very proud of the citizens of New Hampshire for helping her formulate that plan. PAGEGovernor Hassan, thanks so much for joining us. HASSANThank you very much. Take care. PAGEThat was Governor Maggie Hassan. She is the governor of New Hampshire. Well, Dr. Nora Volkow, tell us, looking at this on a national scale, how big a problem is this today? VOLKOWOh, good morning. Thanks for having me here. Unfortunately, it's a very tragic problem of very large impact and it would speak about the numbers. The last ones really is from CDC, estimated that approximately 29,000 people die in 2014 from an opioid-related overdoses and that basically reflects deaths from prescription opioids and deaths from heroin. So if you think about it, 29,000 people dying, you can get an idea of the magnitude of the problem. PAGEDr. Kolodny, you are the chief medical officer at Phoenix House. I know you've been dealing with drug addiction issues for a long time. You've said that this is the worst drug addiction crisis this country has ever faced. Why is that? KOLODNYActually, the CDC is calling this the worst drug epidemic in United States history. And they're saying that because when you look at the rate of overdose deaths during the height of the crack cocaine epidemic in the late '80s, early '90s and the heroin epidemic in the '60s and '70s, the number of people dying today is just far, far higher than anything we've ever experienced before. Those previous drug epidemics were mainly concentrated in inner city, low income, minority communities. KOLODNYThis is an epidemic that's affecting counties in every single state in the country and many counties have a very severe problem. PAGEWe're joined here in the studio by Amy Cassagnol. You have a very personal story about this terrible crisis, a tragic story about your son. Please tell us just briefly about what happened to him. CASSAGNOLWell, about three years ago, JP, he came to me and admitted that he had been addicted to opiates for awhile. He had had a knee surgery in high school. And my first initial response was, oh, thank goodness, it's not drugs. It's, you know, prescription drugs. We'll fix that with rehab. Well, you know, three years later, we find out it was just one long nightmare after another. PAGEAnd what do you -- I know you sought help for him. CASSAGNOLThank goodness, you know, I have great insurance, you know. We tried to go through the insurance companies. We found many different places, some better than others. It was just a real tough challenge. You don't know who to turn to. You know, the stigma, it was just very difficult. There were no right answers. PAGEAnd do you think there is still a stigma? Is that still a problem when you're talking about this issue? CASSAGNOLI think there is, but I think the more people talk about it, the more the media is covering this huge epidemic, it's lessened. However, I think the addicts still have a sense of shame. I think there's some attitude out there that there's some kind of moral issue with addicts instead of, you know, their true need of, you know, needing help and therapy. PAGEWell, we're very sorry for your loss and we know that you're on this show because you want to reduce that stigma and let people know a little more about it because it's not -- you were saying in the interview before the show that it's not a decision that you make to become addicted. CASSAGNOLIt is not. And, you know, when I first learned about it, of course, you know, it tore apart our family. You know, the blame was on JP and after, you know, meeting in groups and going to NANA and hearing other people's stories, you begin to realize that it is not their choice. He was not, you know, he didn't choose to be an addict. He was such a bright young man. I mean, he loved life. He loved reading. He had so many friends, that strong family support. CASSAGNOLEverybody loved him. He had no reason to do this. And he knew the dangers. He didn't know the dangers and neither did we when he was prescribed these opiates. PAGEWe're going to talk about why this has happened, what parents and teachers can do. We're going to take a short break. When we come back, we're going to continue our conversation. We're going to take your calls. Our phone lines are open, 1-800-433-8850. Or send us an email to drshow@wamu.org. Stay with us. PAGEWelcome back. I'm Susan Page of USA Today sitting in for Diane Rehm. And joining me in the studio: Dr. Nora Volkow, she is director of the National Institute on Drug Abuse, it's part of the National Institutes of Health. And Amy Cassagnol, she's a teacher and a parent of a young adult son who struggled with heroin addiction. And we're joined from New York by Dr. Andrew Kolodny, he's the chief medical officer at Phoenix House. He's a senior scientist with the Heller School for Social Policy and Management at Brandeis University. PAGEDr. Volkow, how is this epidemic different from other ones that you've dealt with? VOLKOWWell, what's very unique about this epidemic is that it arose actually out of the health care system. The prescription of opioids is basically -- has increased dramatically since 2000. And in parallel to this increase, there has not been an increase in the training and education of medical students or providers on how to properly manage pain and how to properly prescribe opioids. And as a result, there has been an overreliance on their use without proper understanding, and an overconfidence on the belief that if you prescribe opioids on patients that have pain, they're not going to become addicted. VOLKOWAnd unfortunately the data has shown us that that's not the case and that approximately 10 percent of patients that are prescribed these medications will become addicted. And this risk increases, of course, if the prescription is to teenagers. PAGESo 10 percent of the people who get prescribed these powerful painkillers -- and, of course, they're prescribed them because they need them, presumably, because they're in great pain -- will become addicted to them. A whole new set of problems. What -- why -- what can doctors do about that. What should they do. That seems like a very high rate of addiction. VOLKOWWell, there are several things that doctors can do. And, first of all, be aware actually of the factors that increase the risk for someone to become addicted to these medications. Another very important thing that they can do and they have to do is to learn to recognize when one of their patients is becoming addicted to their drugs and intervene. And if they become addicted to their drugs, one of the things that they need to do is treat that patient. PAGEDo you think doctors are increasingly aware of that or is there still a big education campaign that's needed? VOLKOWUnfortunately there's still a very big education campaign that's needed. And it's needed not just actually for the proper recognition and management of pain and use of opioids, but also very importantly for the recognition and management of substance abuse disorders, including addiction to prescription opioids. PAGEAmy, did you feel that the doctor who was treating your son was aware enough of this? CASSAGNOLWell, no, I don't. Because when I first -- when I found JP's schedule for his medication, he was prescribed, I think, three opiates in the morning and three at night, and medications in between for nearly a week. And that was on his first surgery, I think. That was when he was a junior in high school. But then when he went back for a smaller knee surgery, I remember very vividly standing outside the room when the doctor handed him a prescription after his minor knee surgery and chuckled when he said, watch out for this stuff. You know what it'll do to you, and kind of chuckled. And, of course, hindsight, that started my nightmare. CASSAGNOLI didn't know. I've had several knee surgeries myself, my husband, you know, we get the 30 Oxycontins. You take one maybe -- maybe, you throw the rest into your medicine cabinet with the rest of your cold medications and you don't think twice about it, because you're not aware. And so hopefully with all the talk going on, people will become aware. They will lock that stuff up. They will return it. They'll throw it out. PAGEDr. Kolodny, how do you think we got to this place? Is it over-prescription of drugs or what do you think has happened? KOLODNYThat's a great question. As Dr. Volkow mentioned, as the prescribing of opioids pain medicines increased, it led to parallel increases in addiction and in overdose deaths. So what this really means is that this epidemic has largely been caused by the medical community overprescribing pain medicines. And the reason that we started to prescribe so aggressively, starting in the late '90s, is that we were responding in many ways to a brilliant marketing campaign that had been launched initially by just one drug company, Purdue Pharma, when it launched Oxycontin. KOLODNYIt launched that drug with a campaign that misinformed prescribers about the risk of addiction and exaggerated the benefits of using opioids long term for common, chronic conditions, like low back pain or chronic headache or fibromyalgia -- conditions where long-term use of opioids is probably not safe or effective. And doctors didn't just hear this from the drug company. They heard it from pain specialists who were eminent in the field, who were on the speakers bureaus of the drug companies. And they also began hearing it form their professional societies, from state medical boards, from hospitals, from the Joint Commission. KOLODNYSo every single -- from every single direction, the medical community began to hear that we had been allowing patients to suffer needlessly because of an overblown fear of addiction. And that the compassionate way to treat just about any complaint of pain was with an opioid. And as we responded to this campaign and as the prescribing increased, it led to a public health catastrophe that we're dealing with today. PAGESo I think a lot of Americans would hear that story and be outraged that it was basically the pursuit of profits by a pharmaceutical company that misled doctors, which resulted in too many prescriptions, which has prompted this addiction crisis. I mean, doesn't that -- isn't that outrageous, enraging, wrong? KOLODNYYes, they should be outraged. I think it's important to mention that there were many people involved in the movement to encourage opioid prescribing who weren't doing this because drug companies were paying them. They were truly duped. They truly believe that we were under prescribing opioids that were a gift from Mother Nature and that we could be more compassionate. I think that many of these individuals might have been able to figure out quicker that what they were teaching or promoting made no sense, were it not for some of the profit motive and the fact that they were getting paid handsomely for promoting use. But I think many people truly believe much of what they were saying. VOLKOWThere is another factor that also has collided to create the problem that we currently have, and it's that we have an epidemic of pain in the United States. And it's estimated that 30 percent of Americans suffer from some form of pain. And that goes to 40 percent among older individuals. And chronic pain can be quite devastating. And unfortunately we do not have many effective therapeutic interventions. And as a result of that, it has become very easy for many physicians to rely on an opioid prescription because they want to help their patients. So we have two epidemics colliding: an epidemic of chronic pain and, on the other one, an epidemic on the abuse of these medications. PAGEYeah, well, that's a good point. We have an emailer who makes a similar point. This person writes, a few years ago the FDA was considering banning one of the common opioids because of abuse. My mother was fighting cancer and needed that drug. Why deny an effective drug to those who need it, because of abusers? VOLKOWAnd that is where the fine point comes. How can we take advantage of the many benefits that an opioid, when properly prescribed, can have to a patient, well at the same time protecting those that could be at risk of becoming addicted on overdoses. There -- we should be able to take advantage of them. And that's why we need to improve on education and protect those that may be at danger. KOLODNYI see it a little bit differently from Dr. Volkow. I think it's important to recognize that opioid medications are lousy drugs for chronic pain. They are essential medicines for easing suffering at the end of life. They're important medicines when used short term, for severe pain, for example, after major surgery. But the bulk of the prescribing is for conditions where opioid are probably not safe or effective. And the idea that we should be focusing on teaching doctors the so-called right way to use opioids for chronic pain, I think is a flawed notion. KOLODNYAs this epidemic has worsened every year for the past 15 or 20 years, what we've heard repeatedly is that we have two problems in America: the problem of drug abuse and the problem of chronic pain. Don't do something about the drug abuse problem that will worsen the chronic pain problem. And the notion there is that these medicines are helping people with chronic pain and all of the harms are limited to the so-called drug abusers. And that's just false. We don't have two distinct populations: one harmed and one helped. And in fact the best evidence is telling us that overdose does occur most commonly in patients receiving legitimate prescriptions from doctors for a chronic pain problem. CASSAGNOLI wanted to say something about the word abuse in that email. That is what people think, that these people abuse these drugs. Well, I don't think initially they abuse the drugs -- at least in JP's case. JP was overprescribed as a child. He didn't have a choice. We trusted the doctors. They prescribed them. We think he's going to get better and, instead, he got worse. And, you know, he didn't have a choice. He was addicted immediately. So where is the risk versus the benefits for this drug? You know? The risks for somebody whose brain is still developing I think is way too high. If somebody were allergic to penicillin, the doctor would screen that person, wouldn't give them penicillin. CASSAGNOLBut you can't screen for addiction. We don't know if J.P. had the addictive gene. But 10 percent of the population might be addicted. So where's the risk versus benefit? VOLKOWYeah. And I think that one other tendency that we have is to polarize arguments because it makes things much easier. And when I -- for example -- when I was saying we need to teach physicians how to properly prescribe opioids, I was not necessarily just implying for chronic pain, for which effectively there's less evidence. But if we don't treat acute pain properly, for example, that may transition into chronic pain. So we have to understand under what conditions opioids may be beneficial and under what conditions they may be detrimental. VOLKOWAnd for the issue of how do we determine who is at risk, we cannot predict it 100 percent, which highlights why we need to be very cautious about these potential adverse effects of prescription opioids. PAGEWe're going to go now to the Agriculture Secretary Tom Vilsack, who joins us by phone from his office in Washington. Secretary Vilsack, thank you for being with us. MR. TOM VILSACKYou bet, Susan. Good to be with you. PAGENow, you're on because President Obama has announced this month he was appointing you to lead a new interagency effort to address heroin and opioid abuse. What will you be doing? VILSACKWell, the focus obviously is going to be on the impact in rural America. Obviously this is a huge problem. I'm sure your listeners have heard the statistics, over 2 million Americans basically abusing pain medications. Many of them ultimately transitioning into heroin addiction because in rural areas it's less expensive than the prescription drug. Huge health care costs, $25 billion, a huge loss of productivity to our economy, but most importantly and tragically, 16,000 lives lost a year, and many of those lives are in rural areas. VILSACKRural areas have an acute challenge here. Primarily because they don't have the services that are available in urban areas. They don't have the mental health services. In fact, 76 percent of shortages of mental health professionals are in rural areas. There's a stigma -- the notion of toughen it out, being on your own, handling your own problems -- sometimes makes it hard for people to recognize they've got a substance-abuse issue or a mental illness that they've got to deal with. And the economic aspect of this is important because, as we look at the rural economy, sometimes the difficulties experienced in rural areas sometimes exacerbate the problem. VILSACKSo I think the president wants the Rural Council and myself as the chair of the Rural Council to take a look at this specifically as it relates to rural areas. And one last point, and that is that it is a particularly profound on middle-aged white males. The suicide and drug poisoning rate for that group of people in this country has seen an incredible increase. And if we had just maintained the level of decline that we saw previous to 1999, during this last 15-, 16-year period, we would have saved 500,000 lives. PAGEI'm Susan Page and you're listing to "The Diane Rehm Show." We're talking to Secretary Vilsack about this new interagency effort he's heading. What's the federal role when it comes to this issue? VILSACKWell, I think the federal role is to basically work in a very integrated and comprehensive way with state and local folks and nonprofit entities to try to provide an awareness and, particularly in rural areas, focusing on awareness of what the risk signs are, what the telltale signs are. Making sure that pharmacists are doing what they need to do in terms of monitoring. Making sure that they're -- that those who are prescribing drugs are well trained. Making sure that if there is an overdose that first responders and those paramedics or that voluntary fire department who responds in rural areas has what they need in terms of drugs, has what they need in terms of being able to treat that person immediately. VILSACKFiguring out creative ways to work with -- in partnership with state and local governments to provide a broad array of mental health and substance abuse services that candidly don't exist today in many parts of the country. And just generally raising an awareness that this is a community issue and that people have to be prepared to help. PAGEYou know, one of the remarkable things is the number of families that are touched by this issue, either an addiction themselves or a parent, a child, a neighbor or a friend. And I understand that, in your own family, you've had -- its struggles with addiction. Do you mind telling us about that? VILSACKWell, I was adopted into a family that was a loving and caring family. But my mom, when I was a young fellow, had some serious issues with prescription drug abuse and alcohol. She was hospitalized a number of times, tried to commit suicide on a number of occasions. And I remember very vividly those circumstances of waking up in the middle of the night and seeing my mom being walked around the foyer of our home, just to keep her awake long enough for the ambulance to come. Having an opportunity to be with my dad on the street corner, asking me to count up the number of windows of a barred-windowed facility, to explain that's where my mom was going to spend some time when she was hospitalized. VILSACKAnd then watching a tremendous leap of faith and a tremendous sense of character and turning her life around with a lot of help. And she became a great role model for me in terms of never giving up on things that are important and that matter. So I understand the pain, from a child's perspective. And I have good friends, most recently, who lost their son to heroin. And the pain of watching them go through that process is something that sort of refreshes my early years. PAGEWe're almost out of time. Just briefly, do you feel that public attitudes toward addiction have changed since you were growing up? Do you think it's different today? VILSACKI think so. I think in the past people thought it was a character flaw. I think people now realize it's a disease and it has to be treated as such. You know, hopefully, we also transition from this notion that we've got to incarcerate people, as opposed to basically providing the public health and mental health services that will allow us to avoid sending folks to jail when they really need help and a community that's supporting them. VILSACKYou know, obviously there's some bad people and they need to be locked away. But many of the people that we're locking away today, if they had mental health services and a little bit of help, they probably wouldn't be in jail. They'd probably be productive members of society. And many of those we've lost to suicide and to drug overdoses would still be with us. PAGESecretary Vilsack, thanks so much for joining us. PAGEThat was Tom Vilsack, the secretary of Agriculture. 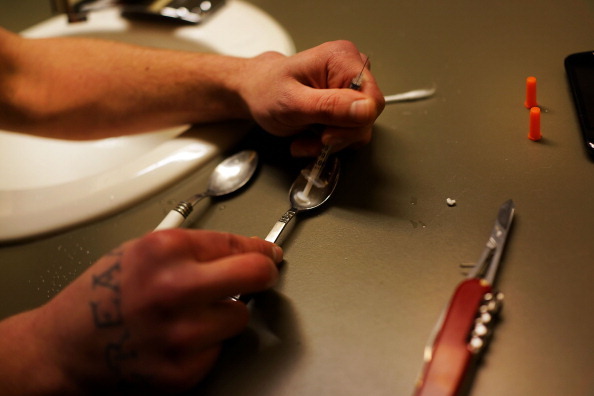 And he's head of a new interagency federal effort to address heroin and opiate abuse. We're going to take a very short break. And when we come back, we're going to discuss the outlines of this addiction crisis. We're going to go to the phones and talk to you about your own experiences and views on this. And we'll turn to our panel to ask them what they think about what we've heard from Governor Hassan and now from Secretary Vilsack. We'll take your calls, 1-800-433-8850 is our toll-free number. You can always send us an email to drshow@wamu.org. Stay with us. PAGEWelcome back. I'm Susan Page of USA Today, sitting in for Diane Rehm. Joining us from New York, Dr. Andrew Kolodny, chief medical officer at Phoenix House. And in the studio with me, Dr. Nora Volkow, who's director of the National Institute on Drug Abuse, and Amy Cassagnol. She's a teacher. She's a parent of a young son -- young adult son who recently died of a heroin overdose. PAGEWe want to let our listeners join this conversation. Let's go to Sandia Park, N.M., and talk to Ambrose. Ambrose, hi, you're on the air. AMBROSEHi. I have congenital degenerative arthritis to most of my joints. It first manifested when I was seven in the subluxing of my knees. When I was 15 I had the first of many joint surgeries and was innocently introduced to intermuscular Demerol, which I could not help but relate to the emergence of what I call my true self. Through the four decades that followed I stupidly and shamelessly exploited the condition of my joints to gain ever increasing amounts of opioids and methylphenidate. AMBROSEBy 1999 I was on massive doses of OxyContin and methylphenidate. By 2013 I was nearly dead from my stupid indulgence in these drugs and hard liquor. But my great good fortune is that I had been practicing Carlos Castaneda's Tensegrity since 2004. And that proved over time to save my life. PAGEAmbrose, we're so glad that your situation has improved. And I'm sure many people who have tried to deal with chronic pain have found themselves in situations like yours. You know, we have an emailer who says, "How do you know the warning signs of somebody who may be becoming addicted?" And, Dr. Kolodny, let me ask you that. If somebody's concerned about a relative or a friend, how can they know if it's a -- if this -- if their use of a drug is becoming a problem? KOLODNYIt's -- it can be very difficult to tell. There are many patients who are on opioids long term, who may be truly convinced that the opioids are helping their chronic pain because they know that when they don't take them they're feeling agonizing discomfort. If what we see in those individuals when they've been on opioids for a long period of time is that their function can begin to decline. KOLODNYAnd people who know them and care about them will see that they no longer participate at church or other activities or with the family. They spend their day on the sofa. And when you see this decline in the quality of someone's life, yet they continue taking a drug, they continue to use a drug despite the negative consequences, that individual may be suffering from addiction, but will often argue that they're no addicted. They'll believe they're not addicted because they're getting pills from a doctor. KOLODNYAnd so for patients like that, it can be subtle and difficult to detect. Some people with addiction will develop out-of-control use, where they'll have very clear abhorrent drug-taking behavior. They run out of their pills very quickly. They go back to the doctor. They'll doctor shop. For those patients, addiction can be much more obvious. PAGEAnd so what do you do if you're -- if you care about someone and you feel like they're headed down this path? KOLODNYIt can be very difficult. And we have -- this is a disease that's devastating families across this country. I think that many people with the disease do in fact know that they're suffering. If you're opioid addicted you wake up in the morning feeling awful until you've taken your first dose of an opioid. Many people who are suffering from this condition will even seek out treatment early on. KOLODNYUnfortunately, what they often are referred for is a detox treatment, or a short stay at a rehab. And they quickly wind up relapsing. And you'll see many people giving up hope. If someone has a loved one who's suffering from addiction, I think they have to do their best to try and help that individual. In some cases it can be difficult to do. And what someone should do is seek out help for themselves. KOLODNYFor example, people can attend 12-step meetings for family members of -- if you've got addiction in your family. And you can get help from others who are suffering from the same disease affecting their family. VOLKOWWell, we have to recognize that addiction is a chronic disease. And so what it means is that you may go to the detoxification or rehabilitation program for one month. That doesn't mean at all that you are cure. And as a chronic disease, you have to follow a chronic model. That means that you're going to have to be in treatment for a long period of time. We have actually quite effective medications that can help and have been shown to be significantly improving the outcomes of patients that are addiction -- addicted to prescription opioids, vis-a-vis their use of drugs. VOLKOWBut they have also been shown to actually interfere and prevent overdoses -- methadone, buprenorphine, naltrexone or Vivitrol. And as you were commenting at the beginning, unfortunately, even though this medications have been shown to significantly improve outcomes, they are not being deployed in those that need them. And even in specialized treatment programs for substance use disorders, it's less than one-third of the ones that are making these medications available to those that need them. PAGEWell, why aren't they being used more often? VOLKOWThere -- interestingly, there is a culture in the treatment programs that believes that you are just changing one drug for another one. And as a result of that, there has been an automatic rejection by many treatment programs of the use of methadone or buprenorphine. That is actually not the case because methadone, while it also an opioid agonists, as is buprenorphine, have very different properties to those of medications when they are used for abuse. VOLKOWAnd they can actually sustain the systems that have been -- and reverse in some instances the systems in the brain that have been affected in the process of drug addiction. So they help the patient interfere with the strong cravings, as well as with a very negative mood that ensues when you become too addicted to the drug and you don't have it. PAGEAmy, you've had the experience of being a parent facing this situation. For parents, what would you say to them? What advice would you give them if they're concerned about a child who they think might be falling into addiction? CASSAGNOLWell, speak to your child, obviously. And just become more aware. There was no outer signs for J.P. I mean, he -- it was around the time when he became a teenager. And, you know, teenagers show those couch-hugging times anyway. But, you know, I was fortunate enough that J.P. came to me. And J.P. sought help. I mean, I feel bad for those kids and families who don't have all the support and resources that we had. And even with the support and resources it has been a nightmare. PAGEWe've got an email from Mari, who writes, "I think the fact that heroin is so cheap, it's imperative to discuss the fact that people can now buy it easily. Children can buy this drug without much effort and become addicted after a few times. My mother had six grandchildren. She lost one to an overdose. My own child became addicted. We are white-collar families so you cannot judge the families living in two different states or even compare the way they were raised. The common factor is the drug." Is that right, Dr. Kolodny? Is heroin now readily available and a lot cheaper than it used to be? KOLODNYYes, that's right. To understand the connection between prescription opioids and the rise in heroin, I think it's important to understand that we have two age groups that have been affected by the opioid addiction epidemic, a younger group and an older group. The younger group, people in their 20s and 30s, when they develop opioid addiction it's usually through either recreational use or medical use or sometimes a bit of both. KOLODNYWhen they get addicted and they need to maintain a large supply, even if that addiction developed through medical use, doctors are generally uncomfortable giving lots of pills to healthy-looking 25-year-olds. So unless the doctor is a drug dealer, they don't want to keep supplying that young person. That young person winds up on the black market. The pills are very expensive on the black market. And if they're in a region of the country where heroin is available, they'll switch. KOLODNYAnd what we've seen happen over the past 15 years is that heroin has become more available in parts of the country where it never before existed to meet the demand for it by people who have become opioid addicted. But you also have to recognize that there's an older group. People in their 40s, 50s, 60s, 70s and 80s who are becoming opioid addicted mostly through medical treatment for a chronic pain problem. That older group, when they get addicted, they do not need to turn to the black market. KOLODNYThey can generally find a doctor who will continue prescribing them very large quantities of pills. And even if the primary care doctor begins to get uncomfortable, the patient is coming in early, they're demanding higher and higher doses, often that primary care doctor, because the patient is complaining of pain, refers those patients to pain specialists. And what's very interesting and not reported on enough, is that the overdose death rate is much higher in that older group than it is in the younger people who are switching to heroin. In fact, the age group with the highest rate of prescription opioid overdose death is people who are 45 to 54 years old. PAGEWow, that's just amazing. Let's go to Shepherdstown, W.V., and talk to Marie. Marie, thanks for holding on. MARIESure. I, over the years, have been diagnosed with several chronic painful conditions and have been prescribed several medications. And I find myself concurrently prescribed three pain medications, very high doses and quantities of them. And it kept me -- it brought me out of bed after a year and a half of chronic pain where I couldn't work. But my question is at this point, since I'm so reliant on them, when my doctor decides to take me off of one or all of them, what am I to do to avoid something like turning to an illegal, illicit drug, which, of course, I don't want to do? How am I to manage my pain when that happens? PAGEMarie, what a great question. I know that affects a lot of people. Do one of the two doctors want to address that? KOLODNYSure, sure. I think for people who are suffering from both chronic pain and addiction or an opioid-use disorder, one of the treatments that can be particularly helpful for those individuals is one of the medicines that Dr. Volkow mentioned. Buprenorphine or Suboxone is a medication that many doctors who are treating people in this situation are finding to be very helpful. We have about 10 to 12 million Americans who are on chronic opioids. The best available evidence is telling us that the majority, about 80 percent, are not doing well. KOLODNYUnfortunately, many of these individuals may never be able to come off of opioids because of the changes in the brain that occurred through repeated exposure. And for these individuals, buprenorphine or Suboxone may be one of the better tools we've got to help treat them. VOLKOWAnd I -- and another point that is important to make, and actually highlights how difficult the management of chronic pain is, is that the use of opioids, chronic use of opioids by itself can enhance the perception of pain, something that we call hyperalgesia. And this, in many instances, lead to physicians to increase the doses, which will make it worse, as opposed to sometimes what is seen, that the pain decreases once the doses start to go down. VOLKOWSo the other issue that is very relevant to emphasize is that we over-rely on medications to treat basically not just pain, but many conditions. And the recognitions that the use of combined interventions that are not just based on medications for the management of pain, can actually lead to much better outcomes. Such as, for example, meditation or there are interventions that are now using electrical stimulation of the brain or of the spine cord to minimize pain. So there are other strategies that we can use to improve the outcome of pain in patients suffering from it. PAGEI'm Susan Page and you're listening to "The Diane Rehm Show." Here's a tweet we've gotten. This person posts, "When heroin ravaged African Americans the use was criminal and immoral. Now, it's a health issue. Racism is deep." I wonder, Dr. Kolodny, do you think attitudes toward this are different because we see it affecting many white Americans and fewer African Americans? KOLODNYYes. I don't know if a silver lining is the right term to use, but I do believe that now that we have an addiction epidemic that is disproportionately affecting mainstream white America, suburban communities, rural communities, I think that it's helping challenge some of the stigma about addiction. When you had epidemics that were disproportionately affecting low-income minority populations, it was easier to think about the so-called addict as being very different. KOLODNYI think it's important to understand that, you know, the data here is quite striking. The New York Times reported on this recently. Overdose deaths from drugs and addiction to opioids is much more common in whites. The data is very striking when you look at this. And I think it, again, suggests that the driver for our opioid addiction epidemic is over-prescribing of pain killers. Because I believe the racial difference is here is being caused by the fact that the medical community prescribes opioids more cautiously to their minority patients. PAGESo it's a racial stereotype that's really helping the African American community in this particular case. KOLODNYCorrect. I think racial stereotyping is having a protective effect on minority populations. VOLKOWAnd there is another factor, though, that's actually helping to change the stigma, and that is now we understand much more of the changes in the brains that are produced by drugs. And we have come to actually recognize that drug addiction is a disease of the brain, but also understand it much better. For example, using imaging technologies, researchers have been able to indicate which areas of the brain are affected by repeated drug use and explain the behaviors that are so very difficult to those that are not addicted to understand. VOLKOWSo now we have a much, much better understanding about why people that are addicted cannot stop taking the drugs, even though when they consciously want to do it. Their brain has changed. And it has changed in very specific ways. PAGEAnd that makes it hard to treat, right, if your brain has changed because of the drugs you've taken? VOLKOWWell, it makes -- it provides us a landscape that we can use to actually try to develop intervention to revert those changes. The brain is plastic. So that is what allows us on the one hand to learn and to become addicted. But it also allows us to do interventions that can result in rehabilitation. And so we can strengthen those areas of the brain that are harmed by the use of drugs. VOLKOWAnd I completely agree with you. And all of the scientific evidence, actually, has shown exactly what you are saying. Seven days is not going to be beneficial in any way for the treatment. PAGENow, Dr. Kolodny had mentioned the New York Times analysis from last week. And let me just close with something that they wrote. They said that drug overdoses are driving up the death rate of young white adults in the United States to levels not seen since the end of the AIDS epidemic more than two decades ago. And they wrote they are the first generation since the Vietnam War of the mid-1960s to experience higher death rates in early adulthood than the generation that preceded it. Clearly and epidemic across the country. PAGEWell, I want to thank our panel for joining us this hour to talk about it, to talk about some of the new ways of treating it and to describe why this has become such a problem. We've been joined by Amy Cassagnol, a teacher, the parent of a young adult son who struggled with this, Dr. Nora Volkow, director of the National Institute on Drug Abuse, part of the NIH, and Dr. Andrew Kolodny, chief medical officer at Phoenix House and a senior scientist at the Heller Center for School Policy and Management at Brandeis. Thank you all for being with us.